Who doesn’t dream of being rich? “Grow the Bean and Win the Green!” Are you or your friends stumped when it comes to choosing lotto numbers? In addition, have you exhausted every means of trying to find lucky numbers? From here on, no more guessing in the dark for lucky lotto numbers. 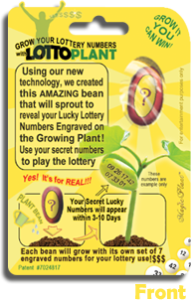 In fact, Magic Plant offers a solution to choosing your next batch of lucky numbers. As a matter of fact, this new method is a fun and unique way for lottery lovers of all sorts to come up with their next set of numbers. Whether you just enjoy playing, or have a friend you want to purchase an original gift for, the plant is the perfect solution. 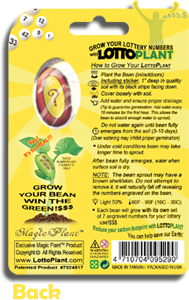 In fact, just plant this Lotto Plant bean, then watch it sprout. Once it sprouts, it reveals your secret lucky numbers. As the plant continues to grow, the numbers appear engraved on the plant! Of course, true Lotto lovers choose their numbers for each week’s drawing. It’s not likely they have thought of this unique method for obtaining lottery numbers. Ultimately, that makes the lottery number plant a perfect gift. Casual to avid participants are going to love this new, fun method for choosing their numbers! It’s easy and it’s fun! What a great way to celebrate a birthday or other memorable occasion. On the other hand, the lottery is a special occasion all by itself. So get your Lotto Plant today! Ultimately, Lotto Plant makes a great gift for anyone with Lotto Fever! A new “must have” everywhere lottery tickets and gifts are sold. Do you know someone who plays the lottery? No doubt they would enjoy this unique way to obtain lottery numbers. On the other hand, purchase one for yourself and have some fun growing your own lottery numbers. Of course, the Lotto Plant makes a great gift for lottery lovers everywhere!